A jogger runs away from campus at a steady rate, stops to talk to some friends, runs away from campus for a little longer, and then returns to campus. 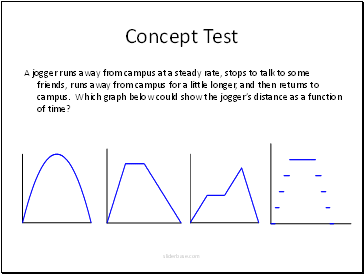 Which graph below could show the jogger’s distance as a function of time? 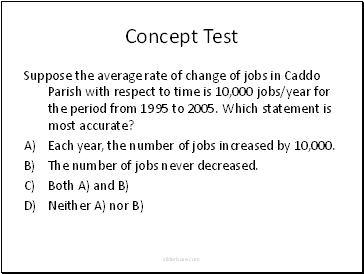 Suppose the average rate of change of jobs in Caddo Parish with respect to time is 10,000 jobs/year for the period from 1995 to 2005. Which statement is most accurate? Each year, the number of jobs increased by 10,000. The number of jobs never decreased. 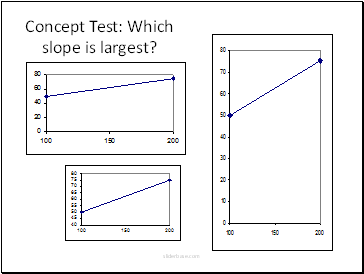 Concept Test: Which slope is largest? 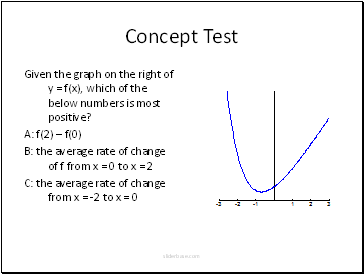 Given the graph on the right of y = f(x), which of the below numbers is most positive? 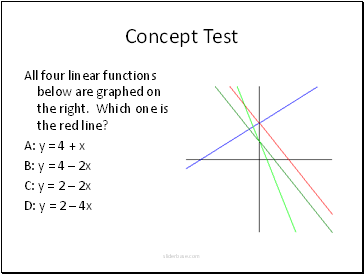 All four linear functions below are graphed on the right. Which one is the red line? Which car was most expensive to purchase? Which car is the cheapest to operate per mile? After 60,000 miles, which car has had the lowest cost of ownership? 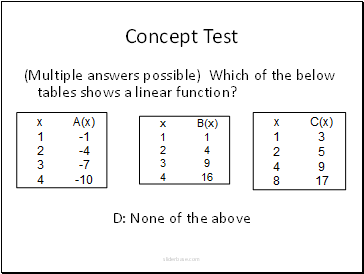 (Multiple answers possible) Which of the below tables shows a linear function? 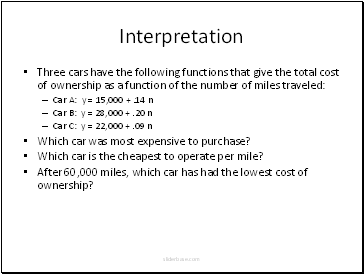 For which functions is y not directly proportional to x? 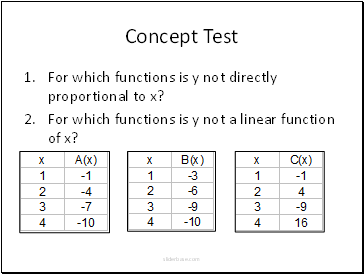 For which functions is y not a linear function of x? 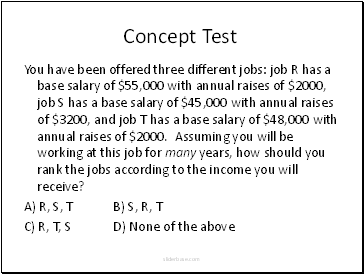 You have been offered three different jobs: job R has a base salary of $55,000 with annual raises of $2000, job S has a base salary of $45,000 with annual raises of $3200, and job T has a base salary of $48,000 with annual raises of $2000. Assuming you will be working at this job for many years, how should you rank the jobs according to the income you will receive?